Gorilla GTS-01 is a 1.5m flat-truss lighting system which is perfect for a range of mobile lighting applications including mobile disco, bands and other lie entertainers. 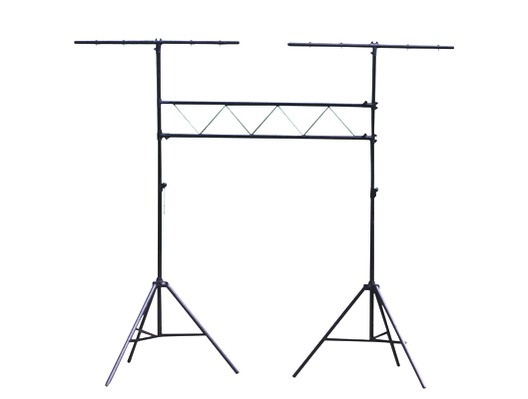 The GTS-01 consists of two heavy duty tripos stands and a 1.5m lighting bridge. This portable system can support a total of 100kg of fixtures making it perfect for larger venues. 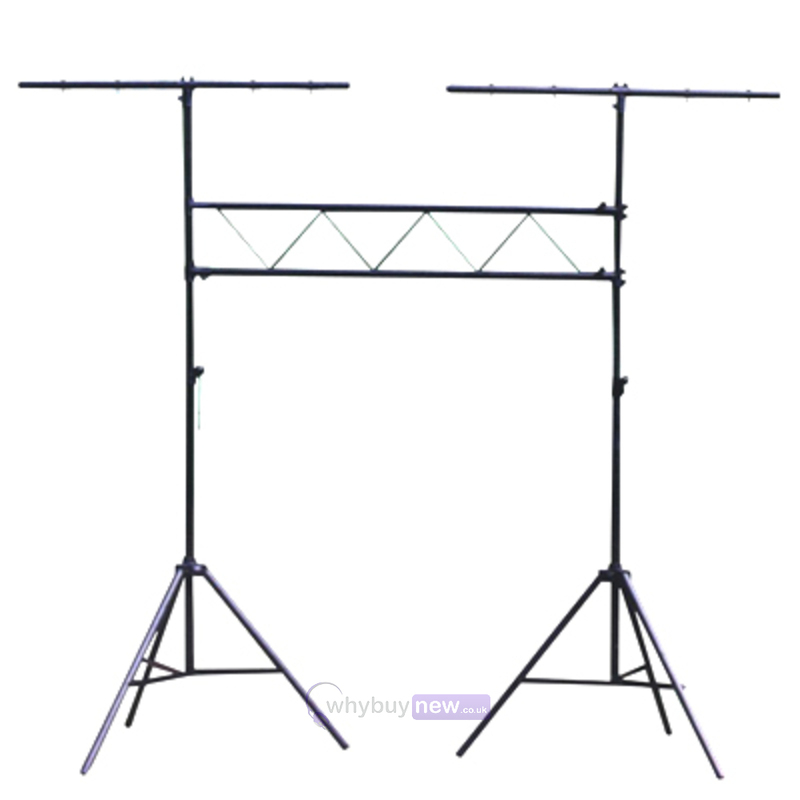 Thanks to a sturdy metal construction, the lighting bridge on the GTS-01 won't bend or sag even when fully loaded and the sturdy upright stands ensure that the stand remains stable, solid and reliable. Each of the tripod stands has its' own T-bar section which can be used to house more fixtures. Despite its' size and capacity, the GTS-01 can be assembled and minutes making it ideal for the mobile disco market where setup times are often critical. Buy strong, reliable support for your mobile lightshow with the Gorilla GTS-01 lighting bridge stand from Gorilla. Here we have the Gorilla GTS-01 Lighting 1.5M Truss Stand in new and manufacturer refurbished which will come boxed 'as new' with a 1-year warranty. Buy this amazing GTS-01 with confidence with 100% satisfaction guaranteed or your money back! Fast delivery as usual from WBN. the stand is a well made stand and truss. Comes with height extensions for the extra height. Easy to assemble, although Gorilla have failed to include assembly instructions. 1 person can assemble easy enough. But 2 people required once assembled to raise to the height you need. Strong enough for a wide variety of lights and effects, and very, very sturdy. Highly recommend. Great quality stand, am currently using as 2 tripod stands though as cannot work out how it goes together, some instructions from Gorilla in the box would have been useful. This is not whybuynews fault though, their service is fantastic as usual!! I haven't got much experience of similar pieces of kit made by other manufacturers to be able to compare it but it certainly seems to be suitably sturdy and very good value for the money. Excellent piece of kit at an amazing price! I've used various lighting stands & this is brilliant. Some instructions would be a bonus on putting it together correctly but other than that....Superb service from WBN - as usual! First things first –great service from WBN – terrific turn around time and I was kept well up to date with the whole process. Bravo, WBN Now to the stand itself; what a brilliant piece of kit. I’ve transformed my performance area to a mini Genesis/Pink Floyd/Rush stage for the less than same price as the single T bar it replaced. The unity is relatively easy to put up- probably added ten minutes to my set up time but the look is well worth it and people are amazed by how it looks. The poles are reassuringly heavy and the truss is also very rigid. The whole thing just reeks of great quality. I can’t praise this unit enough; Five stars for price build quality and service.